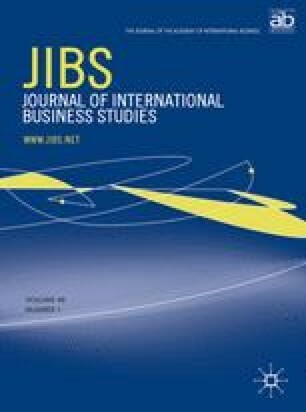 This study investigates the determinants of Chinese outward direct investment (ODI) and the extent to which three special explanations (capital market imperfections, special ownership advantages and institutional factors) need to be nested within the general theory of the multinational firm. We test our hypotheses using official Chinese ODI data collected between 1984 and 2001. We find Chinese ODI to be associated with high levels of political risk in, and cultural proximity to, host countries throughout, and with host market size and geographic proximity (1984–1991) and host natural resources endowments (1992–2001). We find strong support for the argument that aspects of the special theory help to explain the behaviour of Chinese multinational enterprises. We thank Mark Casson for important comments, Tim Rose for his supportive work, and the referees and Focused Issue editors for their insightful and helpful comments. Accepted by Rosalie L Tung and Yadong Luo, Departmental Editors, 23 November 2006. This paper has been with the authors for two revisions. International Monetary Fund (IMF) (2005) World Economic Outlook Database, [www document] http://www.imf.org/external/pubs/ft/weo/2005/01/data/dbcsubm.cfm. (accessed 26 September 2006). Ohio University (2006) Distribution of the Ethnic Chinese Population Around the World, University Libraries, Ohio University [www document] http://cicdatabank.library.ohiou.edu/opac/population.php. (accessed 17 May 2006). Political Risk Services (PRS) (2005) International Country Risk Guide (ICRG), [www document] www.prsgroup.com/ICRG.aspx. (accessed April 2005). Swystun, J., Burt, F. and Ly, A. (2005) The Strategy for Chinese Brands: Part 1 – The Perception Challenge, [www document] http://www.interbrand.com. (accessed 11 January 2006), Interbrand White Paper, Interbrand, New York. UNCTAD (2006) ‘FDI/TNC database’, [www document] http://stats.unctad.org/fdi. (accessed 09 May 2006). UN Statistics Division (2006) UN Demographic Yearbook Special Census Topics, [preliminary release 27 March 2006] [www document] http://unstats.un.org/unsd/demographic/products/dyb/dybcens.htm. (accessed 17 May 2006). WIPO (World Intellectual Property Organisation) (2006) Patents and PCT statistics, [www document] http://www.wipo.int/ipstats/en/statistics/patents/. (accessed 26 September 2006). World Bank (2006) Indicators of Governance and Institutional Quality, [www document] http://siteresources.worldbank.org/INTLAWJUSTINST/Resources/IndicatorsGovernanceandInstitutionalQuality.pdf. (accessed 16 January 2006).